Cancer Debate Forum, Page 34, : This is the New Forum View. Threads are ordered by the Date of the Last Thread Message. I use mms for brushing rinsing teeth and have had zero issues quite the opposite. Three cracked and two cavities with fillings that fell out and exposed root or live root coming through and zero problems . Stronger teeth and dentist won’t even or says don’t need cleaning gums teeth no problems healthy and zero tarter plaques. I use a 30 drop solution too. It’s is all I use . View all messages by EnviableGreens on this forum, all forums. Even worse - Keytruda is a Merck drug! It's a dmanable mainstream prescription drug from Merck - I would not touch it! KEYTRUDA is a medicine that may treat certain cancers by working with your immune system. KEYTRUDA can cause your immune system to attack normal organs and tissues in any area of your body and can affect the way they work. These problems can sometimes become serious or life-threatening and can lead to death. Problems in other organs. Signs of these problems may include changes in eyesight, severe or persistent muscle or joint pains, severe muscle weakness, low red blood cells (anemia), shortness of breath, irregular heartbeat, feeling tired, or chest pain (myocarditis). Complications of stem cell transplantation that uses donor stem cells (allogeneic) after treatment with KEYTRUDA. These complications can be severe and can lead to death. Your doctor will monitor you for signs of complications if you are an allogeneic stem cell transplant recipient. Before you receive KEYTRUDA, tell your doctor if you have immune system problems such as Crohn’s disease, ulcerative colitis, or lupus; have had an organ transplant; have lung or breathing problems; have liver problems; or have any other medical problems. If you are pregnant or plan to become pregnant, tell your doctor. KEYTRUDA can harm your unborn baby. Females who are able to become pregnant should use an effective method of birth control during treatment and for at least 4 months after the final dose of KEYTRUDA. Tell your doctor right away if you become pregnant during treatment with KEYTRUDA. Common side effects of KEYTRUDA include feeling tired; pain in muscles, bones, or joints; decreased appetite; itching; diarrhea; nausea; rash; fever; cough; shortness of breath; and constipation. MEANWHILE, Oleander extract has been successful agains non-small cell lung cancers with none of the above problems. Oleander is natural and it is also the most powerful immune stimulator and immune modulator known to man. Anything that is self duplicating, free and unencumbered by any bodily cells....meaning not proliferating any body cells, is more than just a cell proliferative disease. And the word disease is the end stages of a "cause", it is the cause that is the entity that needs addressed. Treating a disease is just treating the after effects, the symptoms. View all messages by #96043 on this forum, all forums. Barnes and Noble https://www.barnesandnoble.com/w/parasite-zapping-and-the-zapper-david-etheredge/1007876153 , or any other book seller and type in ' parasite Zapping and the Zapper by David Etheredge'. They will let you know if it is available. View all messages by joegrane on this forum, all forums. (Natural News) Janet Napolitano, the former Homeland Security Secretary made infamous for announcing the “see something, say something” campaign that would now be utterly despised by the Left, was nearly killed by an overdose of cancer medications, reports Radar Online. Cancer medications are known for being especially toxic and can cause brain damage, liver damage and kidney damage. “Chemo brain” is a common side effect of chemotherapy treatment, and it is characterized by an inability to focus, loss of memory and loss of cognitive function. There’s little doubt that modern cancer “treatments” actually kill more people than cancer itself. (Yet their death certificates always state they were killed by cancer, not by chemotherapy or radiation.) Learn more about the toxic cancer industry at CancerScams.com. According to Radar Online, Napolitano was diagnosed with cancer last year and has been undergoing “treatment” with toxic chemotherapy drugs for the last five months. Her cancer treatment history demonstrates yet again how the cancer industry is a total failure that never really prevents or treats cancer. “Napolitano had her right breast removed in 2000 after being diagnosed with cancer. Four years later, she had surgery to remove her right ovary and an ovarian cyst,” reports Radar Online. 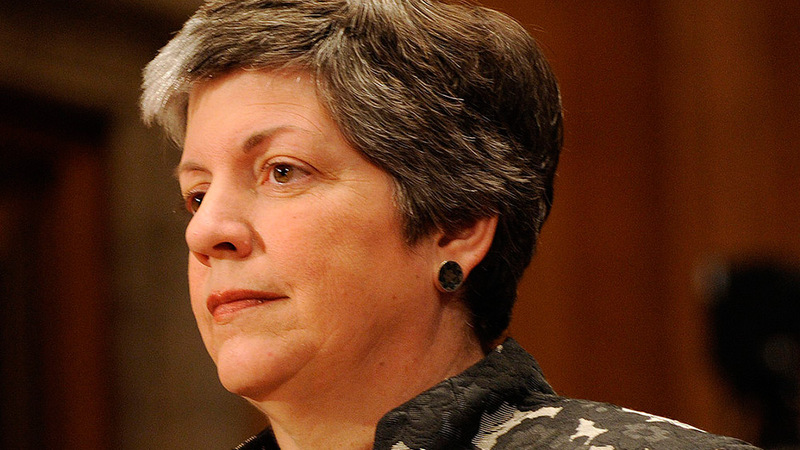 What’s especially sad and ironic in all this is that Janet Napolitano, an obedient minion of the tyrannical police state establishment, is being chemically murdered by the tyrannical medical establishment… and she doesn’t even know it. It turns out that believing establishment lies about cancer can literally cost you your life. Why are we not surprised she’s now in charge of California’s university education system that’s also steeped in a total disconnect from reality? It turns out you really do reap what you sow. the time and watch those presentations. One of the ideas is that a carcinogen causes the depletion of stem cells. At the very beginning this is compensated by a minor tumor and patient despite some fatigue feels healthy. With time the deficiency may grow and so does the tumor. Tumor is a new organ, fully controlled and fully nourished by the organism. It is assumed that stem cells also secrete a vital substance to sustain tissue and prevent Cachexia. One may consider tumor as a factory to produce the missing proteins due to stem cells loss. This factory, so to speak, is not as efficient as the original depleted stem cells and quality is traded for quantity. you-tube. Search for Professor Gershom Zajicek. View all messages by piniKr on this forum, all forums. Enthusiastic about Alternative Cancer Therapies? Looking for support? Go to Cancer Alternatives Support Forum.